Thank you for your interest in advertising with Creative Family Fun! 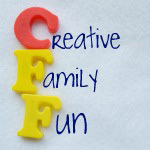 Creative Family Fun is your resource for fun for kids and their entire family. You’ll find crafts, learning activities, and cooking with kids. Creative Family Fun will help you explore the world without leaving home, will help you explore nature, and show you fun ideas for Creative Family Fun Nights. I welcome you to consider advertising with me. Creative Family Fun has a strong social media reach that is growing every day. Sponsored posts: I will create an original and honest post that will relate to your product/service. If there is any other sponsorship idea you have in mind, please contact me. I’d love to work with you. Please email me through the link below for a rate sheet or any questions you may have. I currently offer 4 125×125 advertising spots each month. The ad spaces are located in the left sidebar. If interested in purchasing any of these spots, please email me. Thanks for your interest!